8mm Extreme 9000 single wire replacement kit for 135 degree spark plug boots. 8mm Extreme 9000 single wire replacement kit for 90 degree spark plug boots. Tune-Up Kit includes custom fit extreme heat ceramic boot ferro-spiral core spark plug wire set & Spark Plugs for GM gen 4 LS3/LS4/LS7 engines. This custom fit Race extreme heat ceramic boot ferro-spiral core spark plug wire set fits GM gen 4 LS3/LS4/LS7 engines. Limited To Stock On Hand - This custom fit extreme heat ceramic boot spark plug wire set fits Chevy Camaro / Pontiac Firebird GM F-Body 5.0.5.7L 1987-1992 w/TBI. This custom fit extreme heat ceramic boot spark plug wire set fits small block Chevy engines with HEI 1975-1986 wires under valve cover. This custom fit extreme heat black ceramic boot spark plug wire set fits small block Chevy engines with HEI 1975-1986 wires under valve cover. This custom fit extreme heat ceramic boot spark plug wire set fits big block Chrysler 361-440 with 45 degree boots. This custom fit extreme heat ceramic boot spark plug wire set fits Dodge Dakota, Ram , Durango 3.9L 1992-2001. This custom fit extreme heat black ceramic boot spark plug wire set fits Chevy / GM 2001-2004 - 3/4 & 1 Ton 8.1L. This custom fit extreme heat black ceramic spark plug wire set fits Chevy / GMC Vortec V8 5.0/5.7L 1996-2000. This custom fit black ceramic boot spark plug wire set fits 1995-2001 Chevy / GMC 4.3L V6. This custom fit extreme heat ceramic black boot spark plug wire set fits Chevy/GMC V8 HEI applications 75-86. This custom fit extreme heat ceramic boot spark plug wire set fits Chevy / GM 2001-2004 - 3/4 & 1 Ton 8.1L. This custom fit extreme heat spark plug wire set fits Chevy / GMC Vortec V8 5.0/5.7L 1996-2000. This custom fit extreme heat ceramic boot spark plug wire set fits Chevy / GM big block 1990-1995 (except SS). This custom fit extreme heat ceramic boot spark plug wire set fits Chevy/GMC 1985-1997 5.0/5.7L. This custom fit extreme heat ceramic boot spark plug wire set fits Chevy/GMC Truck 7.4L Vortec engines 1996-2000. This custom fit ceramic boot spark plug wire set fits 1995-2001 Chevy / GMC 4.3L V6. This custom fit extreme heat ceramic boot spark plug wire set fits Chevy/GMC V8 HEI applications 75-86. This custom fit extreme heat ceramic boot spark plug wire set fits Dodge Trucks 5.2/5.9L 1991-1998. This custom fit extreme heat ceramic boot spark plug wire set fits Ford 5.0L EEC-IV 1983-1993. This custom fit extreme heat ceramic boot spark plug wire fits Ford Mustang 1986-1993 and Ford Trucks 7.5L 1988-1998. This custom fit ceramic boot wire set fits 1997-2004 Camaro / Firebird / Corvette LS1/LS6 engines. This custom fit extreme heat ceramic boot ferro-spiral core spark plug wire set fits GM gen 4 LS3/LS4/LS7 engines. This custom fit extreme heat black ceramic boot ferro-spiral core spark plug wire set fits GM gen 4 LS3/LS4/LS7 engines. These black ceramic boot spiral core universal fit spark plug wire sets have straight 180 degree boots. 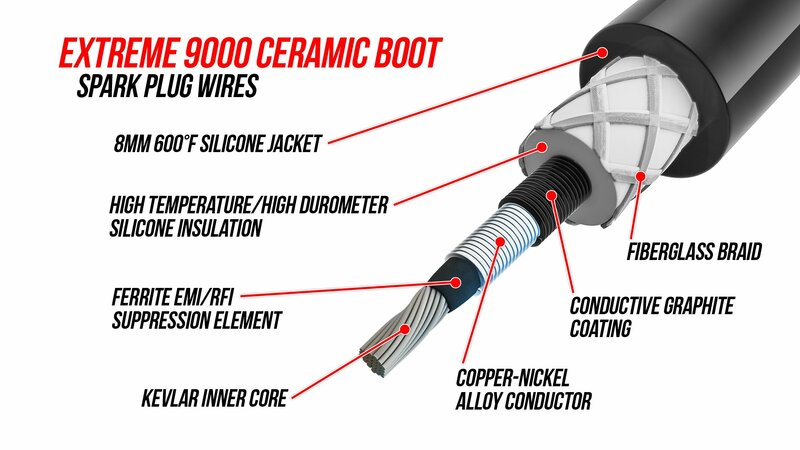 These ceramic boot spiral core universal fit spark plug wire sets have straight 180 degree boots. This custom fit extreme heat ceramic boot spark plug wire set fits Chevy/GMC 7.4L C,K 25HD-35 H4D cast iron exhaust manifold. This custom fit extreme heat ceramic boot spark plug wire set fits 2007 to 2011 Jeep Wrangler JK with a 3.8L V-6 engine. 8mm Extreme 9000 single wire replacement kit for straight spark plug boots.